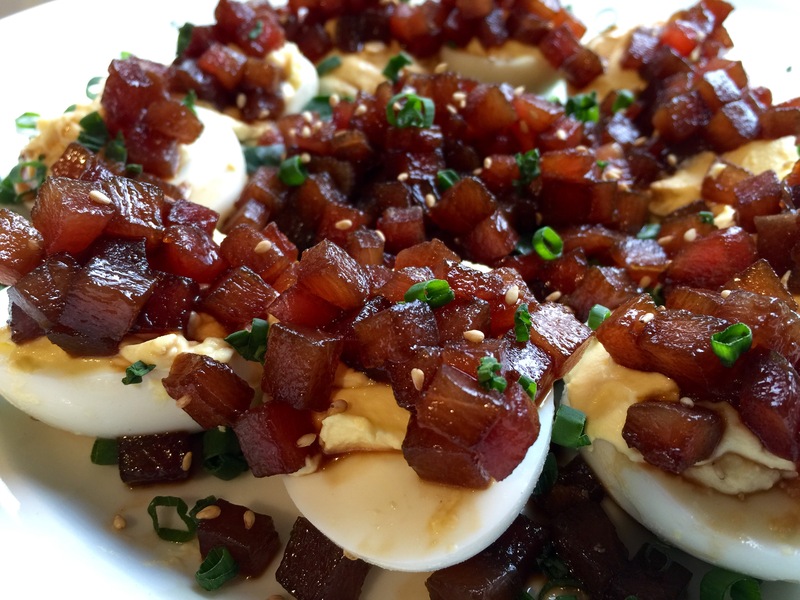 One of our favorite restaurants in Southern New England is The Back Eddy in Westport, Massachusetts, and one of their best-selling appetizers is a simple but delicious deviled egg plate with raw tuna on top. It’s so good, it’s the only thing on the menu that my wife and I refuse to share…we always get a plate for ourselves! My favorite method of hard-boiling eggs is to put them in a pot of cold water. Turn the heat on high and bring to a boil. As soon as the water boils, turn the heat off and place a lid on the pot. Let it sit for 15 minutes. Perfect eggs every time. Remove the eggs from the water and cool them in the fridge, or in a bowl of ice water if you’re going to be serving this dish right away. Here in Rhode Island, I can get fresh tuna right off the boat. Ideally, they say you should freeze all raw seafood before eating it. In general, killing parasites requires freezing and storing fish at a surrounding temperature of minus 4 degrees Fahrenheit or colder for seven days; or freezing at a surrounding temperature of minus 31 degrees or colder until the fish is solid and storing at the same temperature for 15 hours; or freezing at a surrounding temperature of minus 31 degrees until the fish is solid and storing at minus 4 degrees or below for 24 hours. That’s a lot of work and worry. I find that I can get high quality tuna already frozen into convenient bricks at Whole Foods or on-line at websites like Vital Choice, one of my favorites for extremely high quality, responsibly sourced seafood. I always try to buy responsibly sourced, fair trade seafood, like this beautiful ahi tuna. If the tuna is frozen, let it thaw a little. If it’s fresh, place it into the freezer for about 10 minutes to firm up. That makes it easier to cube up. 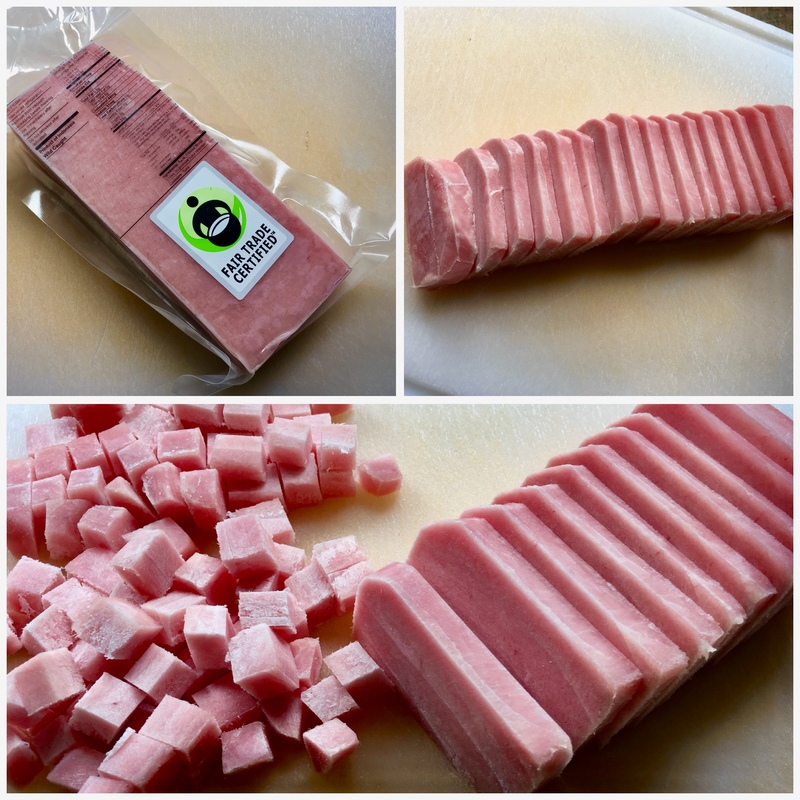 Slice the tuna carefully into the smallest cubes you can make. Once done, place the tuna in a bowl and put it back in the fridge to continue its slow thawing until ready to use. In a separate small bowl, combine the soy sauce and the chili oil. Set aside. Finely chop the scallions. Set aside. Once the eggs have cooled, peel them and cut them in half. Scoop out the yolks and place them in a bowl, starting with 1/4 cup of the mayonnaise. Add more mayo if needed. Mix well. I use a fork or whisk to get as many of the lumps out as possible. If you want to go crazy, you can put them in a blender or food processor to make a creamy puree. You can place the puree in a piping bag and carefully squeeze it out into each egg half. I simply use a spoon. Once all the egg halves are filled, place them on a spinach leaf-covered dish and put them back in the fridge until ready to serve. Or, instead of the bed of spinach, peel a cucumber and cut the ends off. Slice the cuke into 1/2″ thick slices. Then, using a melon baller, carefully scoop out the seeds from the center to make a “cuke donut.” Use these as little stands to hold your eggs on the plate. When you’re ready to serve, take the tuna out of the fridge. Pour the soy sauce/chili oil mix into the bowl with the tuna and mix well. Let the tuna marinate for just 2 minutes. Pour off the excess marinade, or it’ll get too salty. Remove the plate of eggs from the fridge and carefully put a small spoonful of tuna on top of each one. Garnish with the sesame seeds and the chopped scallions and serve immediately. This is a huge hit wherever I bring it. 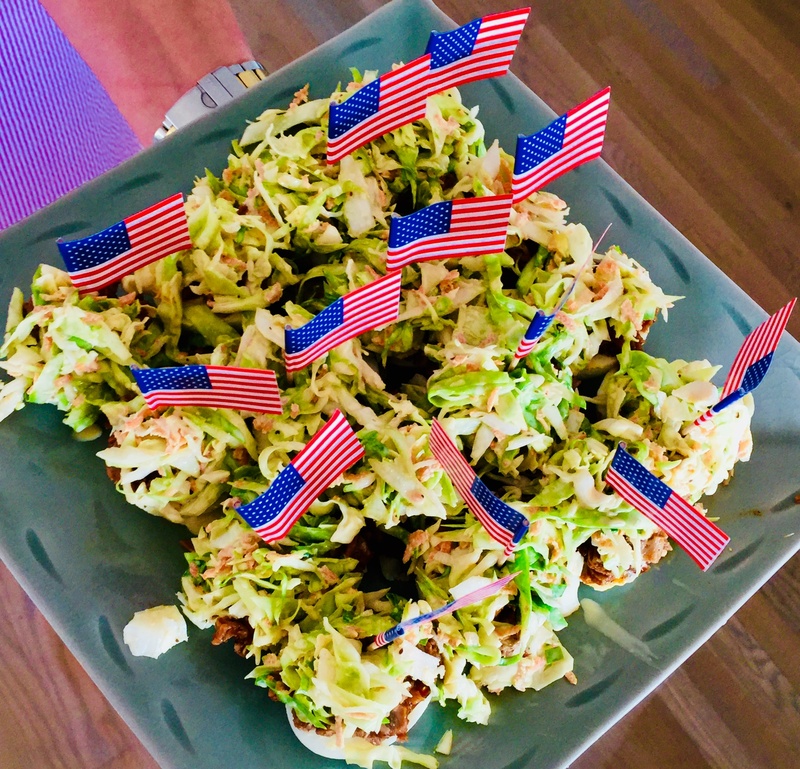 I brought it to a dinner party last night to celebrate the 4th of July. It’s easy to set up the parts at home, then put it together quickly at a party. 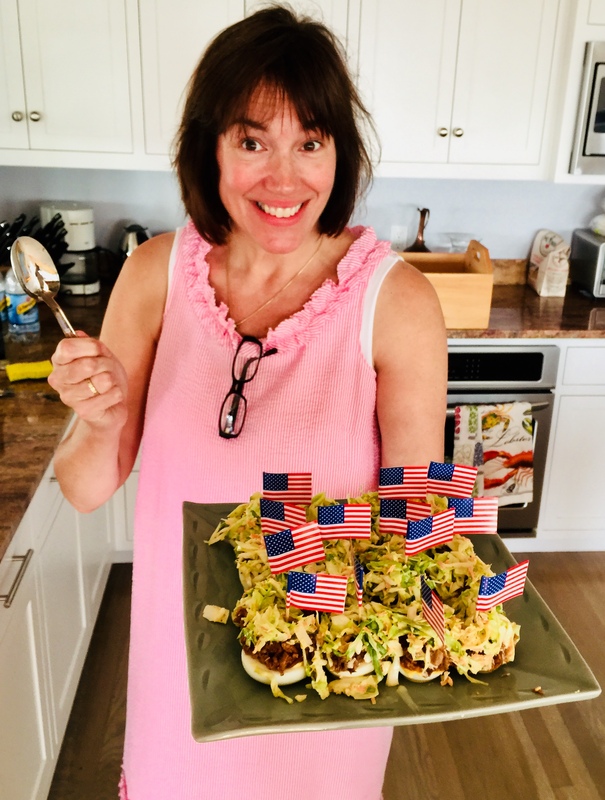 If you know what a pulled pork sandwich North Carolina-style is all about (pulled pork on a bun with cole slaw right on top of the meat), then imagine taking away the bun and replacing with a deviled egg! It’s messy, it’s delicious, and everyone loves them. I’ve tried this two ways now: with pulled pork and with chicken…and the big thumbs up goes to the pork. Of course, I will smoke a pork shoulder for 10 hours, pull the meat, and mix it with the barbecue sauce…all for this dish. If you don’t have a smoker, you can simply wrap a smaller piece of pork shoulder in aluminum foil (it’s good if it’s fatty), and bake it in the oven at 250 degrees for a few hours until the meat is juicy and falls apart. Combine all the ingredients in a saucepan and simmer over medium heat for about 25 minutes, until the sauce has thickened. Let it cool to room temperature and then store it in the fridge. It will be good for several weeks. Combine all the cole slaw ingredients in a bowl, mixing well, and place it in the fridge. Making the cole slaw a day ahead of time is even better. Always great to have a pretty helper! Here’s my tip for perfectly hard-boiled eggs every time: place the eggs in a pot, cover them with cold water, and turn the heat on high. Just before the water starts to boil, put a lid on the pot and turn the heat off. Let the eggs sit in the hot water for 15 minutes. Perfect hard-boiled eggs every time! Once cooked, keep the eggs in the fridge. Here’s another tip: the easiest peeling eggs are older eggs! No…that doesn’t mean you let your eggs sit out on the front porch for a week. What that means is: but them from your supermarket rather than the farm stand down the road. Super-fresh eggs still have a membrane attached to the shell that makes them difficult to peel. The membrane detaches in slightly older eggs, making them easier to peel. Slice the eggs in half and place the yolks in a bowl with the mayonnaise and mustard. Mix it well and keep it in the fridge. To assemble, take a teaspoon of the mayo/mustard/yolk mixture and place it in the cavity of one of the egg halves. Place a lump of pulled pork on top (I like it warm, to counter the cold of the mayo and cole slaw.) Then place a teaspoon of the cole slaw on top of the chicken. This recipe is gluten-free, as long as you use GF soy sauce. Pre-heat the oven to 250 degrees. Combine the ketchup, apple cider vinegar, soy sauce, hot sauce, and brown sugar in a oven-proof pot with a lid. Mix well, then add the chicken breasts, making sure they’re immersed in the sauce. Cook low and slow in the oven for about 3–4 hours. When the chicken is cooked through, shred the meat with 2 forks. Set it aside, but keep it warm. Combine all the cole slaw ingredients in a bowl, mixing well, and place in the fridge. For perfectly hard-boiled eggs, place the eggs in a pot of cold water, and turn the heat on high. Just before the water starts to boil, put a lid on the pot and turn the heat off. Let the eggs sit in the hot water for 15 minutes. Once cooked, keep the eggs in the fridge. Slice the eggs in half and place the yolks in a bowl with the mayonnaise and mustard. Mix well and keep in the fridge. To assemble, take a teaspoon of the mayo/mustard/yolk mixture and place it in the cavity of one of the egg halves. Place another teaspoon of the shredded chicken on top (I like it warm, to counter the cold of the mayo and cole slaw), drizzling a little of the BBQ sauce that you cooked the chicken with on the meat. Then place a teaspoon of the cole slaw on top of the chicken. In this particular case, I decided to make it on my own. It’s really not hard to do…just takes a little time. But the end result is totally worth it. The best way to hard-boil eggs is to put them in a pot of cold water. Turn the heat on high and bring to a boil. As soon as the water boils, turn the heat off and place a lid on the pot. Let it sit for 15 minutes. Perfect eggs every time. Remove the eggs from the water and cool them in the fridge. If the tuna is frozen, let it thaw a little. If it’s fresh, you might need to place it into the freezer for about 10 minutes to firm up. That makes it easier to cube up. Slice the tuna carefully into the smallest cubes you can make. Once done, place the tuna in a bowl and put it back in the fridge until ready to use. Once the eggs have cooled, peel them and cut them in half. Scoop out the yolks and place them in a bowl, starting with 1/4 cup of the mayonnaise. Add more mayo if needed. Mix well. I use a fork and try to get as many of the lumps out as possible. If you want to go crazy, you can put them in a blender or food processor to make a creamy puree. And again, you can place the puree in a piping bag and carefully squeeze out the puree into each egg half. I simply use a spoon. 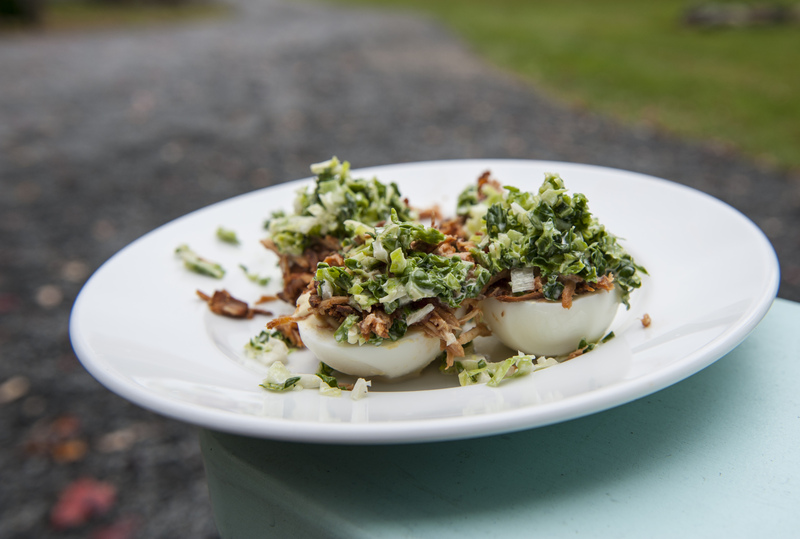 Once all the egg halves are filled, place them on a spinach leaf-covered dish and put them back in the fridge until ready to serve. When you’re ready to serve, take the tuna out of the fridge. Pour the soy sauce/chili oil mix into the bowl and mix well. Let the tuna marinate for just 2 minutes. Then pour off the excess marinade, or it’ll get too salty. Optional: Instead of the bed of spinach, here’s another way to serve that works just as well: Peel a cucumber and cut the ends off. Slice the cuke into 1/2″ slices. Then carefully remove the seeds from the center to make a “cuke donut.” Use these as little stands to hold your eggs on the plate. When ready to serve, remove the eggs from the fridge and top them with the raw tuna without marinating it first. Drizzle the soy sauce/chili oil over the top of the eggs, garnishing with the sesame seeds, scallions, and a touch of fish roe. This was a hit when I brought them to a recent neighborhood party. 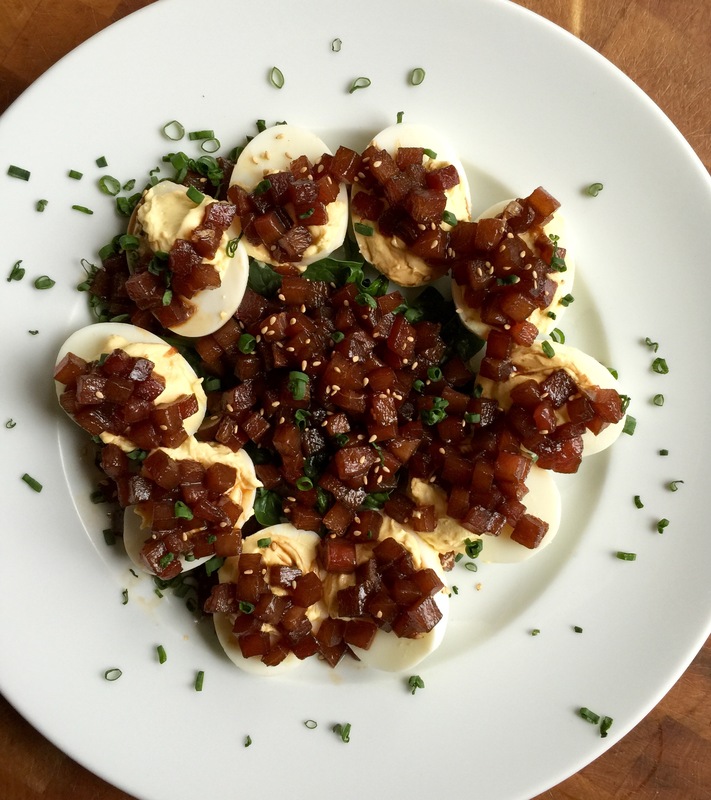 Imagine the best of a deviled egg and a BBQ chicken sandwich, and you’ve got this appetizer that rocks in more ways than one. This is a great app you can make ahead of time: I boil the eggs and make the cole slaw the day before, then keep them in the fridge. Even the chicken can be cooked the day before and then warmed through before assembling right before your guests arrive. Combine the ketchup, apple cider vinegar, soy sauce, hot sauce, and brown sugar in a Crock Pot or heavy pot with a lid. Mix well, then add the chicken breasts, making sure they’re immersed in the sauce. Cook low and slow for about 4 hours. If using a pot with a lid, place in a pre-heated 250-degree oven and cook for 6 hours. When the chicken is cooked through, shred the meat with 2 forks. Set aside, but keep warm. To assemble, take a teaspoon of the mayo/mustard/yolk mixture and place it in the cavity of one of the egg halves. Place another teaspoon of the shredded chicken on top (I like it warm, to counter the cold of the mayo and cole slaw), drizzling a little of the BBQ sauce on the meat. Then place a teaspoon of the cole slaw on top of the chicken.